I woke up this morning to snow on the ground. I moved from Upstate New York to Southwest Virginia 10 years ago to get away from snow. My plan is not working. I’m sick of snow, and cold, and wind. Always the optimist (that’s a lie), I tried to stay positive by thinking about all the wonderful things that spring brings (sings, dings, stings… Oh, oops, is that annoying?). Anyway, of all of these thrilling things, grilling popped into my head first. I love sitting in the back yard, with the sun’s rays warming my face while smelling Mike’s latest basting or BBQ sauce sizzling away on the hot grill. While fantasizing about this, my mind then went to a bad place: smoked meat. (i.e. smoked briscuit, smoked chicken wings, smoked baby back ribs, etc.) You might be thinking, “What is wrong with you? That sounds delicious!” It is. Very delicious. If you like the taste of smoked meat, which I don’t. I feel like I’m eating the coals that lay in the bottom of our fire pit. So what do you do when you hate the taste of smoke in your food, but your husband and his best friend / grilling cohort (enter Bret) think the taste of smoked food is the best thing since, oh I don’t know, ESPN was invented?! For a long time, I didn’t tell Mike about these feelings I harbored towards smoked meat, until my friends convinced me at my bachelorette party that I should tell him. So I did… the day before our wedding. He took it pretty well, actually. Minimal tears were shed, and he still married me. But that doesn’t stop him and Bret from smoking meat every chance they get. There’s only one problem… our friends Bret and Krista live about 3 hours away, so the guys don’t get to smoke meat together that often. So instead, they text about it. And this brings me to the topic of my next blog post: Men and Texting. In spite of all this talk about grilling, I made these pork chops inside (damn snow), but they could just as easily be grilled. In a large saute pan over medium-high heat, add the olive oil. Season the pork chops with the cumin, chile powder and salt and pepper on both sides. When the oil is hot, sear each side of the pork chop for 1 - 2 minutes until browned. Remove the chops from the pan and place in a glass baking dish that has been sprayed with cooking spray. 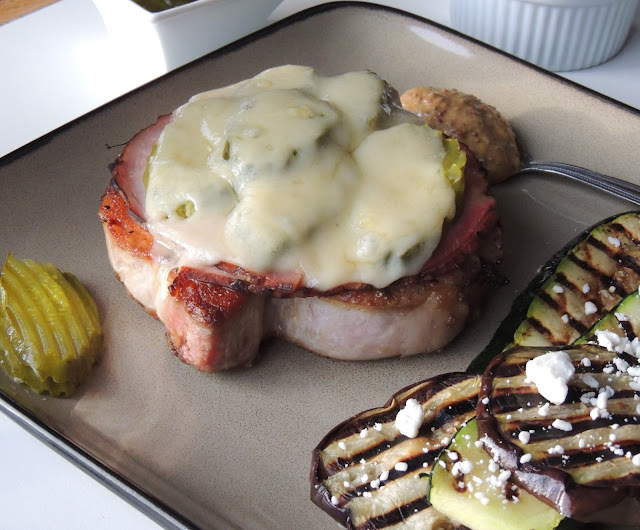 Top each pork chop with 1 slice of ham, a few pickles, and 1 - 2 slices of cheese. Bake for about 20 minutes (may need more or less time depending on the thickness of your chops, mine were about an inch thick). Serve immediately, topped with mustard.